I recently revealed our next big project HERE! We are getting new carpet! Woot woot! It is so incredibly exciting and I am really very grateful to Mohawk for making this entire process possible! As I previously shared, the first thing we did was choose new carpet and padding. 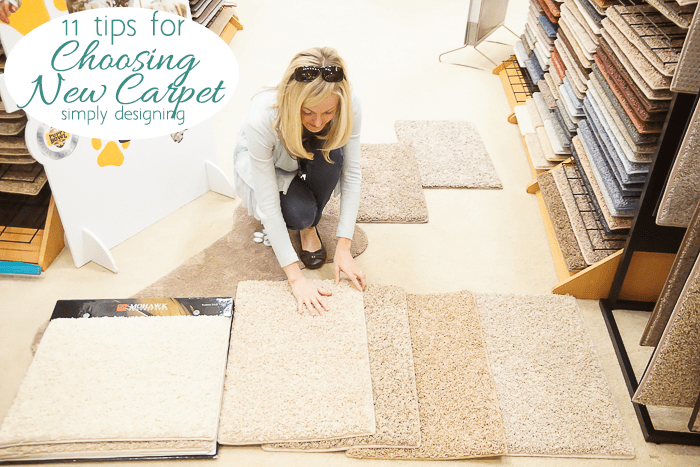 I shared my top 11 Tips for Choosing New Carpet HERE, be sure to check that out and PIN IT if you are considering new carpet any time in the future. 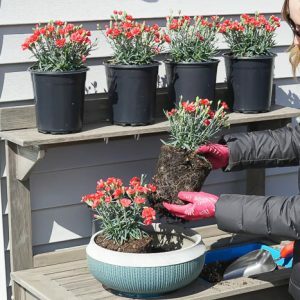 That post is filled with practical tips and ideas! So after we chose our new carpet, several things happened in order to prepare for new carpet to be installed. 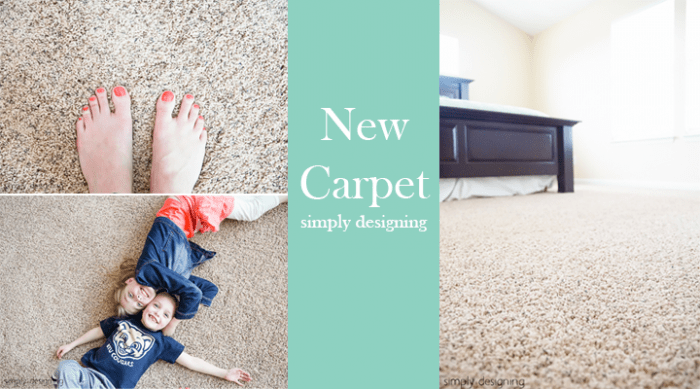 Today, I am sharing my tips for How to Prepare for New Carpet! Most likely the carpet company you are purchasing your carpet through will want to measure your home for you. I’d be worried if they didn’t actually! This will ensure they have enough carpet to allow for proper cuts etc. 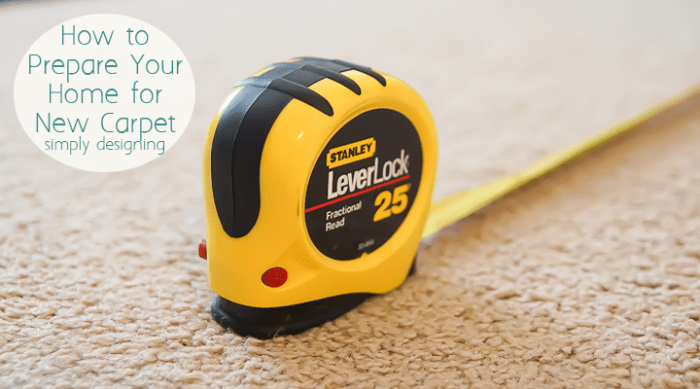 It is ok to use your own measurements for a rough estimate, but before you order carpet, be sure a professional comes out to measure your home for you. If you are like me, I want to know exactly how much something will cost. After your floors are measured, you will get an exact quote for carpet, padding and labor. Go through this and ensure nothing is missing. After you know your exact cost, be sure to budget for it. And check when the deposit and final payment are due so that you aren’t surprised. 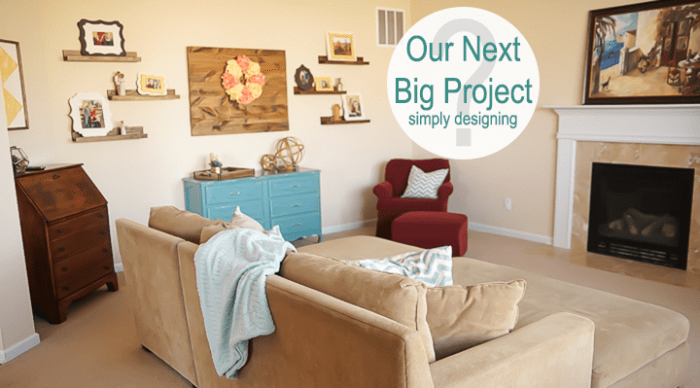 While working with McCool’s Flooring on this project, we came up with an installation plan. We determined that it would be best to install our new carpet in two days. 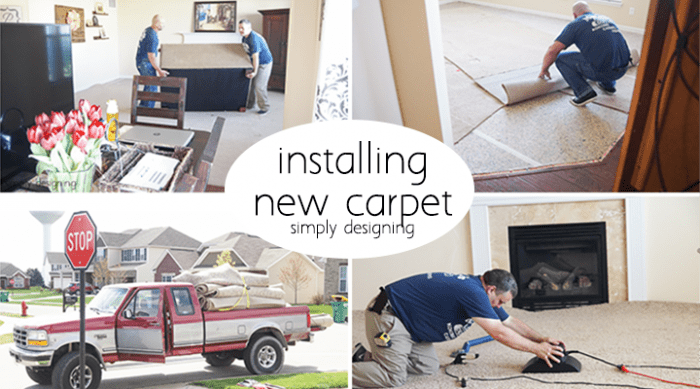 Because the floors have to be completely clear where new carpet is going, and your furniture has to go somewhere, it can be tricky to install all of your carpet in one day. I chose to have mine installed on two concurrent days. This is where you have to make a decision. You can move all of the furniture yourself, or you can pay someone to do it. McCool’s Flooring carpet installers offer furniture moving as an additional service. In my opinion, it is completely worth it if you have the budget for it! They disassemble beds and move everything to other rooms so that they can rip out the old carpet and install new carpet. 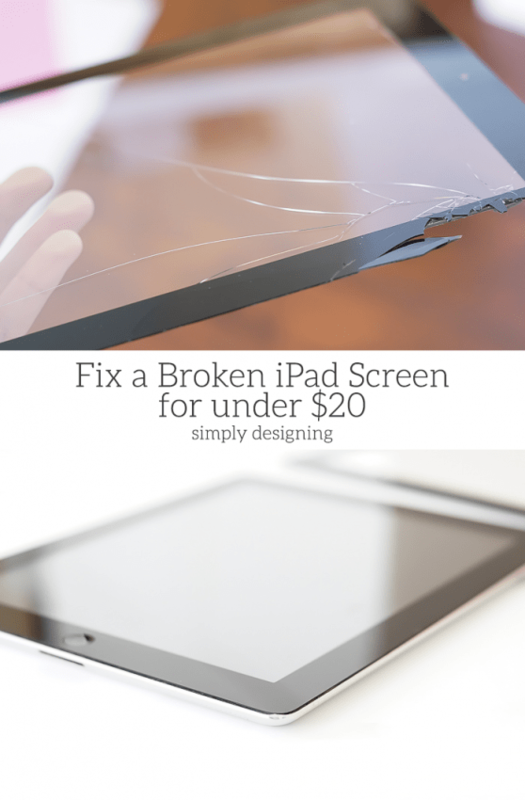 But if you prefer or are trying to save money, you can do this on your own! It is up to you, but think it through and get a cost before you make a decision. If you are doing it on your own, be sure it is done before your carpet installers arrive. You might have to wait before your new carpet is in stock and they have an opening for installation. But don’t worry, it is well worth it. 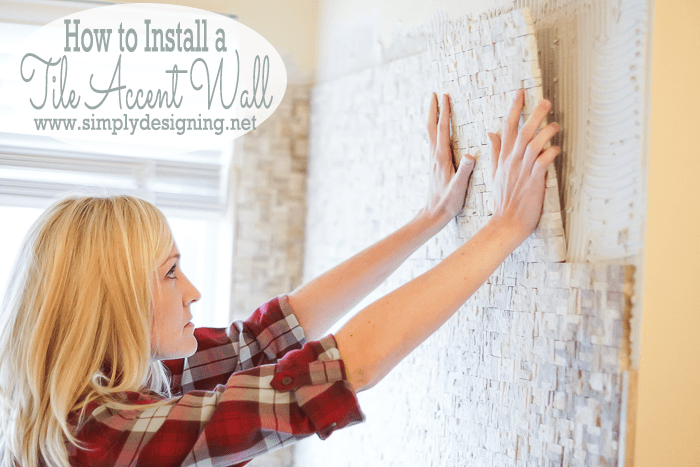 A good installer will do the job right the first time and it is worth any wait you might have. I seriously can not wait until my carpet is installed! And I can’t wait to show it off to you! Eek! I think our installers charge to take away the old carpet and pad, so I think we are going to remove it ourselves. My cousin has a truck that we’ll use to take it to the dump! Thanks for mentioning that so we can save a bit with it! I’m going to be re-carpeting my home, and I’ve been thinking about what I can do to get ready for the big day. I’m happy that I found your post, though, because I haven’t been able to think of many things that I can do! I thought that your suggestions were great, especially what you mentioned about cleaning and preparing the rooms so that the carpet can be installed easily. I know that I would have forgotten about this until the moment the installers arrived at my door! I’m going to put up some notes around my house to help me remember to take all of the furniture out of the rooms that are going to be re-carpeted at least a day in advance. Thank you for the advice! I like that you mentioned that you can get an exact quote for your floor if it is measured. I think that if I was going to replace my carpet then I wouldn’t want to pay for extra materials. I think that you can save a little money if you spend a little extra time preparing to go buy. 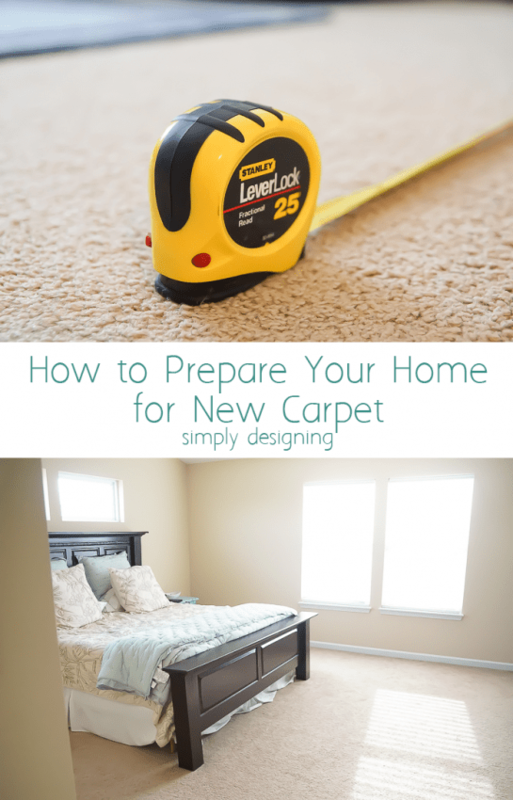 I appreciate all of the tips on how to prepare your home for installing carpet in your home. 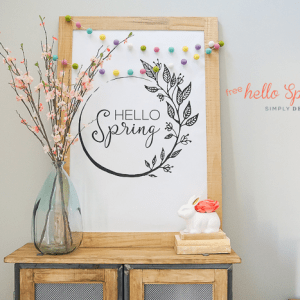 Like you said, measuring the rooms and making a budget are great ways to get started. Another good idea would be to make sure that you have a good company for the job. Doing som research into the company and making sure that they are reliable and experienced is an important part as well.